Azara Landscapes was delighted to be asked to design and build this small garden in Queens Park for a young professional couple who were looking for something contemporary that would compliment the high quality finish of the house interior and make the most of the available space. 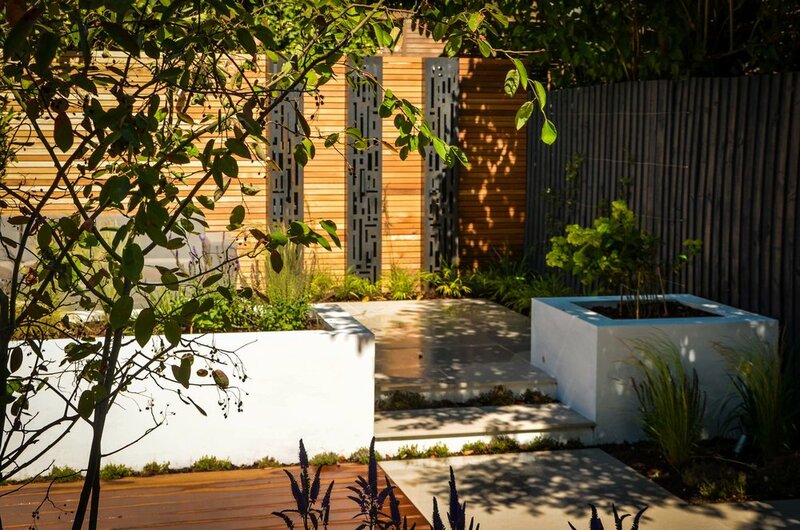 By dividing the space into zones we provided dedicated areas for dinning in the shadiest part of the garden near to the house whilst a lounge area was created at the back of the garden which catches the evening sunshine. In addition we added a decked area for sun loungers all broken up with pockets of planting. At the end of the garden we included three bespoke columns constructed in Corten steel which are backlit at night, providing a focal point that cast interesting shadows and elongates the space. A restrained pallet of materials creates a modern but relaxing feel to the garden with hard wearing porcelain paving contrasting nicely with the hard wood deck and Cedar battens which clad the back wall.